There is a pretty incredible organization in Boston called The Art Connection. 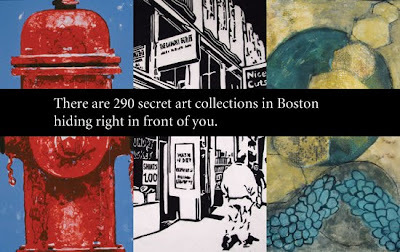 Members of Boston Handmade have donated their work through The Art Connection, and have written about it several times in this blog. You could definitely say that we are fans of the work they do. This nonprofit, founded by artist Fay Chandler, seeks to enrich under-served communities by expanding public access to original works of art. This powerful concept has achieved overwhelmingly positive results since its inception in 1995. The art donation and placement program is like a "museum without borders" as it places the work of donor artists and collectors on the walls of community service organizations such as homeless shelters, rehabilitation facilities, and health centers. In these environments the original works of art stimulate dialogue, creativity, learning and healing. This simple but powerful idea has resulted in thousands of installations into scores of Boston area organizations. As local agencies receive these art donations, they do more than expand their horizons, they also become art collectors. THIS TUESDAY, June 15th, The Art Connection commemorates fifteen years of bringing art to those who often have the least access to it. In conjunction with the ICA/Boston, The Art Connection is co-sponsoring a celebration of collecting local art with a film screening of 'Herb and Dorothy', the incredible true story of the world’s most unlikely art collectors. This event is free and open to the public, though an RSVP is required by calling 617-338-7668 or emailing info@theartconnection.org. The evening at the ICA/Boston begins at 5:30pm with a reception and cash bar. At 6:15pm the program will commence with an introduction by ICA/Boston Associate Curator Randi Hopkins. After the film, Hopkins will lead a Q&A session about finding and buying art that you love, on a budget. The film 'Herb and Dorothy' by Megumi Sasaki won the Best Documentary Prize at the 2009 Provincetown Film Festival and the Audience Award at the 2008 Hamptons Film Festival. The story of Herbert Vogel, a postal clerk, and Dorothy Vogel, a librarian, illuminates how the couple managed to build one of the most important contemporary art collections in history with very modest means. They began collecting art in the 1960's and after thirty years the Vogels managed to accumulate over 2,000 pieces, filling every corner of their tiny one bedroom New York apartment. In appreciation of collectors big and small, The Art Connection is sponsoring this unique evening event to celebrate artists and collectors who make art accessible to people from all walks of life. The ICA Boston is located at 100 Northern Avenue, Boston, MA 02210. MBTA Silver Line: waterfront connector from South Station to Courthouse Station. For directions visit www.icaboston.org and for more information about The Art Connection and how you can donate art, visit www.theartconnection.org.